AMHERST - Walking on air. The very thought is so pleasurable that the expression is used constantly to describe emotionally inspiring success. 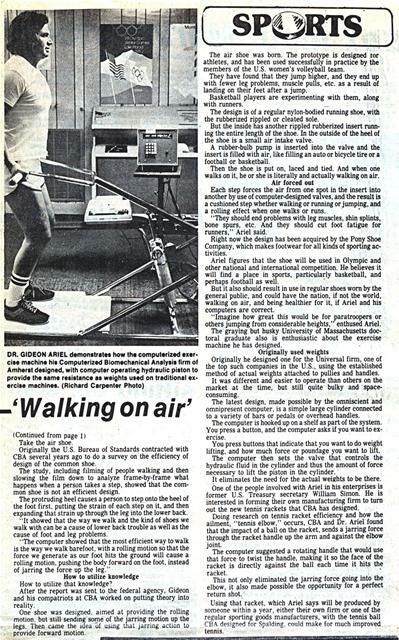 But now a computer and a former Olympic athlete have merged knowledge and technology so they could make "walking on air" totally commonplace. Dr. Gideon Ariel of Belchertown and his Computerized Biomechanical Analysis company in Amherst have designed shoes in which one does walk on air. They are the result of a survey on how efficient is the design of shoes in general, and how can they be made more efficient. The result of that survey and study could be shoes that have one walking on air. And if the air-shoes are the most unusual of the products of CBA, they are not the only ones. For example, there is a new exercise machine that makes it unnecessary to have a large room to house it, and makes it possible to do all your exercises in half the average-size bathroom. There is a tennis racket with a pivoting handle that enables a player to absorb the shock of a ball hit at him and return it with maximum force and accuracy. And there is a study being made for the De artment of Defense on how to make the foot soldier more efficient as far as equipment and uniform are concerned, and what is the most efficient way to hold and shoot a submachine gun. These are some of the more unusual studies that have been or are being made. But there are others, enough others that the business started by Ariel six years ago has now grown into a multi-million-dollar firm that is expanding. AMHERST - It would be ironic, indeed, should 'ï¿½capitalism's answer to communism" result in the U -S. Olympians defeating the Russians at the 1980 games in the capital of communism, Moscow. And, said a man who played a big role in creating the capitalistic answer to communism, such a victory is well within the realm of possibility. Dr. Gideon Ariel of Belchertown, head of Computerized Biomechanical Analysis of Amherst, has been named director of computerizbiomechanical analysis for the U.S. Olympic Committee. The former Israeli Olympian is helping in the operation of the two training camps already set up (at Squaw Valley in California and Colorado Springs, Colo.) and the up-to-25 camps that may be in operation throughout the nation prior to the 1980 games. The larger number of camps depends on the fate of a bill in the Congress tkat would provide more than $30 million to the U.S.O.C. for building and operating such camps. The camps. along with the key camp at Squaw Valley in California. will aim to prepare U.S. athletes to meet the challenge of the Soviet Bloc nations that have done so well in recent Olympics and other world games. who were No. 1, and the East Germans. 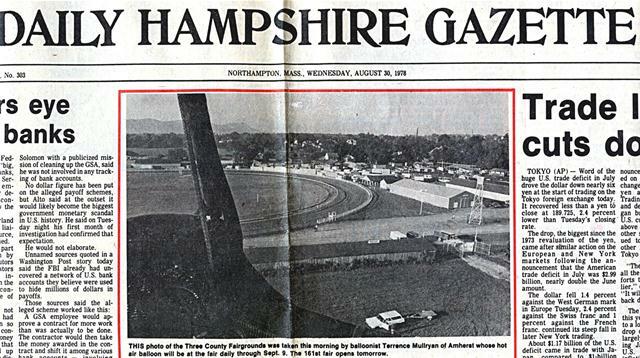 At the time Ariel. who has his Ph.D. from the University of Massachusetts Department of Exercise Science, returned from Montreal where he had observed, photographed and offered advice to U.S. athletes. He felt that unless drastic action was taken the U.S. was bound to grow weaker in relation to other nations, particularly the Eastern European nations. 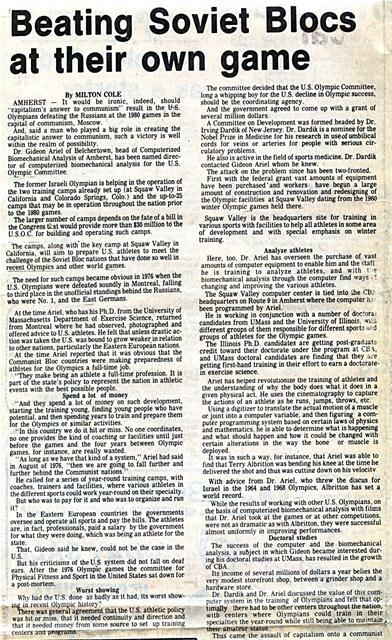 At the time Ariel reported that it was obvious that the Communist Bloc countries were making preparedness of athletes for the Olympics a full-time job. "They make being an athlete a full-time profession. It is part of the state's policy to represent the nation in athletic events with the best possible people. "And they spend a lot of money on such development, starting the training young. finding young people who have potential. and then spending years to train and prepare them for the Olympics or similar activities. 'In this country we do it hit or miss. No one coordinates, no one provides the kind of coaching or facilities until just before the games and the four years between Olympic games, for instance, are really wasted. "As long as we have that kind of a system," Ariel had said in August of 1976, "then we are going to fall further and further behind the Communist nations." He called for a series of year-round training camps, with coaches. trainers and facilities, where various athletes in the different sports could work year-round on their specialty. But who was to pay for it and who was to organize and run it? In the Eastern European countries the governments oversee and operate all sports and pay the bills. The athletes are, in fact, professionals, paid a salary by the government for what they were doing, which was being an athlete for the state. 'Mat, Gideon said he knew, could not be the case in the U.S. But his criticisms of the U.S system did not fall on deaf ears. After the 1976 Olympic games the committee for Physical Fitness and Sport in the United States sat down for a post-mortem. 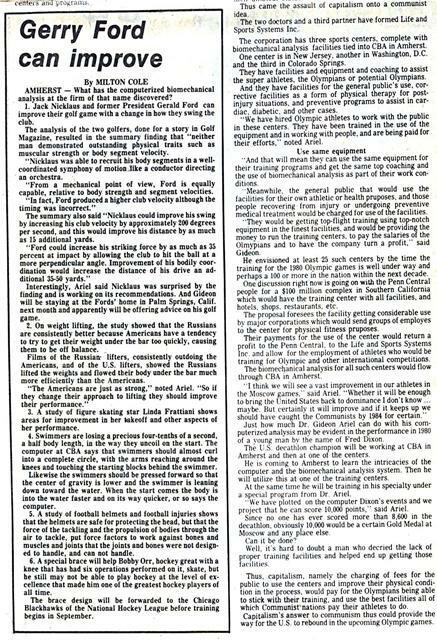 The committee decided that the U.S. Olympic Committee, long a whipping boy for the U.S. decline in Olympic success, should be the coordinating agency. And the government agreed to come up with a grant of several million dollars. A Committee on Development was formed headed by Dr. Irving Dardik of New Jersey. Dr. Dardik is a nominee for the Nobel Prize in Medicine for his research in use of umbilical cords for veins or arteries for people with serious circulatory problems. He also is active in the field of sports medicine. Dr. Dardik contacted Gideon Ariel whom he knew. The attack on the problem since has been two-fronted. First with the federal grant vast amounts of equipment have been purchased'and workers have begun a large amount of construction and renovation and redesigning of the Olympic facilities at Squaw Valley dating from the 1960 winter Olympic games held there. Squaw Valley is the headquarters site for training in various sports with facilities to help all athletes in some area of development and with special emphasis on winter training. Here, too. Dr. Ariel has overseen the purchase of vast amounts of computer equipment to enable him and the staff he is training to analyze athletes, nd with I e biomechanical analysis through the computer find ways changing and improving the various athletes. The Squaw Valley computer center is tied into the CU, headquarters on Route 9 in Amherst where the computer h been programmed by Ariel. He is working in conjunction with a number of doc'ora: candidates from UMass and the University of Illinois, different groups of them responsible for different sports ~r.d groups of athletes for the Olympic games. The Illinois Ph.D. candidates are getting post-graduats credit toward their doctorate under the program at CL t, and UMass doctoral candidates are finding that they a:e getting first-hand training in their effort to earn a doctorate in exercise science. Ariel has helped revolutionize the training of athletes and the understanding of why the body does what it does in a given physical act. He uses the cinematography to capture the actions of an athlete as he runs, jumps, throws, etc. Using a digitizer to translate the actual motion of a muscle or joint into a computer variableï¿½ and then figuring a computer programming system based on certain laws of physics and mathematics, he is able to determine what is happening and what should happen and how it could be changed with certain alterations in the way the bone or muscle is de loyed. With advice from Dr. Ariel, who threw the discus for Israel in the 1964 and 1968 Olympics, Albritton has set a world record. While the results of working with other U.S. Olympians, on the basis of computerized biomechanical analysis with films that Dr. Ariel took at the games or at other competitions, were not as dramatic as with Albritton, they were successful almost uniformly in improving performances. The success of the computer and the biomechanical analysis. a subject in which Gideon became interested during his doctoral studies at UMass, has resulted in the growth of CBA. Its income of several millions of dollars a year belies the very modest storefront shop, between a grinder shop and a hardware store. -t etr amateur status. - - "
AMHERST - What has the computerized biomechanical analysis at the firm of that name discovered? 1. Jack Nicklaus and former President Gerald Ford can improve their golf game with a change in how they swing the club. The analysis of the two golfers, done for a story in Golf Magazine, resulted in the summary finding that "neither man demonstrated outstanding physical traits such as muscular strength or body segment velocity. "Nicklaus was able to recruit his body segments in a wellcoordinated symphony of motion.like a conductor directing an orchestra. "From a mechanical point of view, Ford is equally capable, relative to body strength and segment velocities. "In fact, Ford produced a higher club velocity although the timing was incorrect." The summary also said "Nicklaus could improve his swing by increasing his club velocity by approximately 200 degrees per second, and this would improve his distance by as much as 15 additional yards. "Ford could increase his striking force by as much as 35 percent at impact by allowing the club to hit the ball at a more perpendicular angle. Improvement of his bodily coordination would increase the distance of his drive an additional 35-50 yards." Interestingly, Ariel said Nicklaus was surprised by the finding and is working on its recommendations. And Gideon will be staying at the Fords' home in Palm Springs, Calif. next month and apparently will be offering advice on his golf game. 2. On weight lifting, the study showed that the Russians are consistently better because Americans have a tendency to try to get their weight under the bar too quickly, causing them to be off balance. Films of the Russianï¿½ lifters, consistently outdoing the Americans, and of the U.S. lifters, showed the Russians lifted the weights and flowed their body under the bar much more efficiently than the Americans. "The Americans are just as strong," noted Ariel. "So if they change their approach to lifting they should improve their performance." 3. A study of figure skating star Linda Frattiani shows areas for improvement in her sakeoff and other aspects of her performance. 4. Swimmers are losing a precious four-tenths of a second, a half body length, in the way they uncoil on the start. The computer at CBA says that swimmers should almost curl into a complete circle, with the arms reaching around the knees and touching the starting blocks behind the swimmer. Likewise the swimmers should be pressed forward so that the center of gravity is lower and the swimmer is leaning down toward the water. When the start comes the body is into the water faster and on its way quicker, or so says the computer. 5. A study of football helmets and football injuries shows that the helmets are safe for protecting the head, but that the force of the tackling and the propulsion of bodies through the air to tackle, put force factors to work against bones and muscles and joints that the joints and bones were not designed to handle, and can not handle. 6. A special brace will help Bobby Orr, hockey great with a knee that has had six operations performed on it, skate, but he still may not be able to play hockey at the level of excellence that made him one of the greatest hockey players of all time. The brace design will be forwarded to the Chicago Blackhawks of the National Hockey League before training begins in September. Thus came the assault of capitalism onto a communist idea. The two doctors and a third partner have formed Life and Sports Systems Inc. The corporation has three sports centers, complete with biomechanical analysis facilities tied into CBA in Amherst. One center is in hew Jersey, another in Washington, D.C. and the third in Colorado Springs. They have facilities and equipment and coaching to assist the super athletes, the Olympians or potential Olympians. And they have facilities for the general public's use, corrective facilities as a form of physical therapy for postinjury situations, and preventive programs to assist in cardiac, diabetic, and other cases. "We have hired Olympic athletes to work with the public in these centers. They have been trained in the use of the equipment and in working with people, and are being paid for their efforts," noted Ariel. Meanwhile. the general public that would use the facilities for their own athletic or health pruposes, and those people recovering from injury or undergoing preventive medical treatment would be charged for use of the facilities. "They would be getting top-flight training using top-notch equipment in the finest facilities, and would be providing the money to run the training centers. to pay the salaries of the Olmmpians and to have the company turn a profit," said Gideon. He envisioned at least 25 such centers by the time the training for the 1980 Olympic games is well under way and perhaps a 100 or more in the nation within the next decade. One discussion right now is going on with the Penn Central people for a $100 million complex in Southern California which would have the training center with all facilities, and hotels, shops. restaurants. etc. The proposal foresees the facility getting considerable use by major corporations which would send groups of employes to the center for physical fitness pruposes. Their payments for the use of the center would return a profit to the Penn Central. to the Life and Sports Systems Inc and allow for the employment of athletes who would be training for Olympic and other international competitions. The biomechanical analysis for all such centers would flow through CBA in Amherst. "I think we will see a vast improvement in our athletes in the Moscow games." said Ariel. "Whether it will be enough to bring the United States back to dominance I don't know ... maybe. Hut certainly it will improve and if it keeps up we should have caught the Communists by 1984 for certain." Just how much Dr. Gideon Ariel can do with his computerized analysis may be evident in the performance in 1980 of a Young man Mï¿½ the name of Fred Dixon. The U S. decathlon champion will be working at CBA in Amherst and then at one of the centers. He is coming to Amherst to learn the intricacies of the computer and the biomechanical analysis system. Then he will utilize this at one of the training centers. At the same time he will be training in his specialty under a special program from Dr. Ariel. "We have plotted on the computer Dixon's events and we project that he can score 10,000 points," said Ariel. Since no one has ever scored more than 8,600 in the decathlon, obviously 10,000 would be a certain Gold Medal at Moscow and any place else. Well. it's hard to doubt a man who decried the lack of proper training facilities and helped end up getting those facilities. Thus, capitalism, namely the charging of fees for the public to use the centers and improve their physical condition in the process, would pay for the Olympians being able to stick with their training, and use the best facilities all of which Communist nations pay their athletes to do. Capitalism's answer to communism thus could provide the way for the U.S. to rebound in the upcoming Olympic games. Originally the U.S. Bureau of Standards contracted with CBA several years ago to do a survey on the efficiency of design of the common shoe. The study, including filming of people walking and then slowing the film down to analyze frame-by-frame what happens when a person takes a step, showed that the common shoe is not an efficient design. The protruding heel causes a person to step onto the heel of the foot first, putting the strain of each step on it, and then expanding that strain up through the leg into the lower back. "It showed that the way we walk and the kind of shoes we walk with can be a cause of lower back trouble as well as the cause of foot and leg problems. "The computer showed that the most efficient way to walk is the way we walk barefoot, with a rolling motion so that the force we generate as our foot hits the ground will cause a rolling motion, pushing the body forward on the foot, instead of jarring the force up the leg." How to utilize knowledge How to utilize that knowledge? After the report was sent to the federal agency, Gideon and his compatriots at CBA worked on putting theory into reality. One shoe was designed. aimed at providing the rolling motion, but still sending some of the )jarring motion up the legs. Then came the idea of using that jarring action to provide forward motion. The air shoe was born. The prototype is designed for athletes, and has been used successfully in practice by the members of the U.S. women's volleyball team. wThe have found that they jump higher, and they end up ith fewer leg problems, muscle pulls, etc. as a result of landing on their feet after a jump. Basketball players are experimenting with them, along with runners. The design is of a regular nylon-bodied running shoe, with the rubberized rippled or cleated sole. But the inside has another rippled rubberized insert running the entire length of the shoe. In the outside of the heel of the shoe is a small air intake valve. A rubber-bulb pump is inserted into the valve and the insert is filled with air, like filling an auto or bicycle tire or a football or basketball. Then the shoe is put on, laced and tied. And when one walks on it, he or she is literally and actually walking on air. "They should end problems with leg muscles, shin splints, bone spurs, etc. And they should cut foot fatigue for runners," Ariel said. Right now the design has been acquired by the Pony Shoe Company, which makes footwear for all kinds of sporting activities. Ariel figures that the shoe will be used in Olympic and other national and international competition. He believes it will find a place in sports, particularly basketball, and perhaps football as well. But it also should result in use in regular shoes worn by the general public, and could have the nation, if not the world, walking on air, and being healthier for it, if Ariel and his computers are correct. "Imagine how great this would be for paratroopers or others jumping from considerable heights," enthused Ariel. The graying but husky University of Massachusetts doctoral graduate also is enthusiastic about the exercise machine he has designed. Originally he designed one for the Universal firm, one of the top such companies in the U.S., using the established method of actual weights attached to pullies and handles. It was different and easier to operate than others on the market at the time, but still quite bulky and spaceconsuming. The latest design, made possible by the omniscient and omnipresent computer, is a simple large cylinder connected to a variety of bars or pedals or overhead handles. The computer is hooked up on a shelf as part of the system. You press a button, and the computer asks if you want to exercise. You press buttons that indicate that you want to do weight lifting, and how much force or poundage you want to lift. The computer then sets the valve that controls the hydraulic fluid in the cylinder and thus the amount of force necessary to lift the piston in the cylinder. It eliminates the need for the actual weights to be there. One of the people involved with Ariel in his enterprises is former U.S. Treasury secretary William Simon. He is interested in forming their own manufacturing firm to turn out the new tennis rackets that CBA has designed. Doing research on tennis racket efficiency and how the ailment, "tennis elbow," occurs, CBA and Dr. Ariel found that the impact of a ball on the racket, sends a jarring force through the racket handle up the arm and against the elbow joint. The computer suggested a rotating handle that would use that force to twist the handle, making it so the face of the racket is directly against the ball each time it hits the racket. This not only eliminated the jarring force going into the elbow, it also made possible the opportunity for a perfect return shot. Using that racket, which Ariel says will be produced by someone within a year, either their own firm or one of the regular sporting goods manufacturers, with the tennis ball CBA designed for Spalding, could make for much improved tennis. Generated on 4/22/2019 11:44:23 AM (PST) ADI/HQ/GBA/2019/ARIELCLOUD/v3.0.2018.0126.